Check Out The News From San Diego Comic-Con!!! It’s that time again, San Diego Comic-Con or SDCC is about to blow it’s gates wide open on the weird, strange, geeky and just unusual who have made the pilgrimage to San Diego for this geek-version of Mecca. The entertainment world has teased with promises of viewing new movies first, checking out trailers we’ve waited all year to see and the always entertaining panel discussions that bring fans up close to the actors that play our favorite characters. 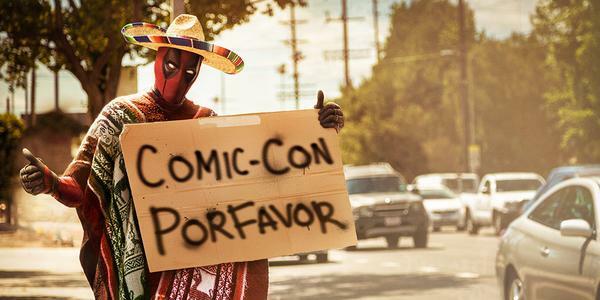 Looks like Deadpool is trying to find a way there, so sit back, relax and follow me on on Twitter or Facebook or check out the hashtag #BoomstickComics for all the latest in Comic-Con excitement. This entry was posted on Wednesday, July 8th, 2015 at 1:16 pm	and is filed under Books, Comics, Events, Film, News, Television. You can follow any responses to this entry through the RSS 2.0 feed. You can skip to the end and leave a response. Pinging is currently not allowed.